Writer-director Quentin Tarantino’s sixth film, Inglourious Basterds is a World War II movie with attitude. Set in mainland Europe at the height of the conflict, it stars Brad Pitt as Aldo Raine, the leader of a crack platoon of Jewish-American soldiers who have dubbed themselves ‘the Basterds’, and who actively seek out and savagely kill as many German servicemen as possible, with the intent of creating fear and discord amongst the troops. His opposing number is Hans Landa (Christoph Waltz), a cruel and ruthless SS officer also known as ‘The Jew Hunter’, whose actions in murdering the family of a young Franco-Jewish family comes back to haunt him when the only survivor, a young girl named Shosanna (Mélanie Laurent), embarks on a plot to assassinate Hitler at the premiere of a Nazi propaganda film. 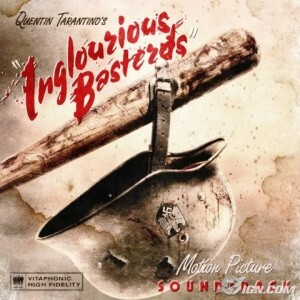 Unusually for Tarantino, he actively sought out composer Ennio Morricone to score his film, but was unable to secure his services due to a scheduling conflict with his score for the Giuseppe Tornatore film Baarìa; instead, he did what he always does: score the film with a lavish temp-track from cult European and blaxploitation movies from the 60s and 70s. It’s difficult to judge the soundtrack in a conventional way, as this is not a conventional soundtrack, but anyone who enjoys the work of the composers featured here, or of Tarantino’s mix-and-match soundtracks, are still likely to find plenty to enjoy. Ennio Morricone’s four cuts, which come from the films The Big Gundown, Revolver and Allonsanfàn, give you an idea of the kind of score Morricone would have written had he been hired to write the entire thing; a lot of it is the nervous, spaghetti-western inspired music with the twangy guitars, stark woodwind writing, and the unconventional choral and vocal performances that characterized his output throughout much of the 1960s. The “Surrender” cue has a quite epic and expansive scope, and “Un Amico” has a romantic Euro-pop sweep, while “Rabbia e Tarantella” slowly builds from a staccato piano motif into a glorious, expansive orchestral march of great flair, energy and memorability. Curiously, “The Verdict” from The Big Gundown features an undisguised excerpt from Beethoven’s Bagatelle in A Minor (“Für Elise”) that is quite eerie in this context. Charles Bernstein’s “White Lightning”, a cool western groove with more twangy guitars and hollow-sounding vocal scats, also featured on the Kill Bill soundtrack and is clearly a Tarantino favorite. Gianni Ferrio’s “One Silver Dollar” is also in the Morricone western mode, albeit with a prominent harmonica solo that gives it an unexpectedly appropriate French lilt. Jacques Loussier’s main theme from Dark of the Sun employs unusual meters and rhythmic devices to create an unsettling mood, while Lalo Schifrin’s “Tiger Tank” from Kelly’s Heroes has a dominant sense of brutal, brass-led bluster. There are also several songs, from Billy Preston’s funkadelic vocals on “Slaughter”, to David Bowie’s psychedelic “Cat People”, and even a couple of German-language salon songs recorded in the period and performed by Zarah Leander, Lilian Harvey and Willy Fritsch. It’s all very unconventional, anachronistic and self-referential, but it’s the way Tarantino thinks, both as a director and as a creator of the musical tone of this films; as a conventional soundtrack, and despite the presence of excellent music from the likes of Morricone and Schifrin, it’s likely too bizarre for score fans to appreciate, but as a glimpse into the mind of Tarantino it’ quite fascinating.